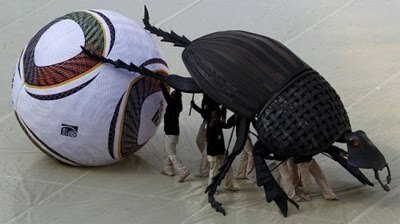 .......................I never knew Dung Beetles could play soccer! That is a socce, IS that a soccer ball? More pictures here. If only such imagination and exuberance were applied to...... never mind you know where I'm goin with that. I wonder what those inter-planetary observers think about this stuff. And the Brits was gonna kick us in the soft spot, huh? Limesters, you be goin' DOWN. And OUT!